Let's celebrate 10 years of Marvel Cinematic magic with the man who started it all, Iron Man! 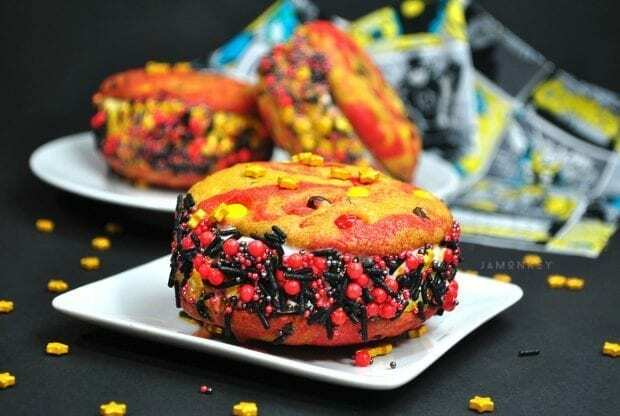 These Iron Man Cookie Ice Cream Sandwiches are the perfect way to show your love for the knight in high-tech armor. 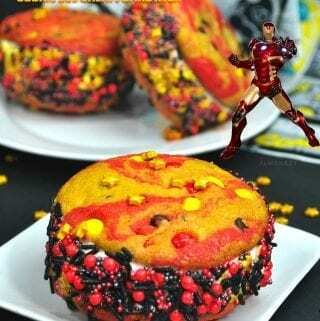 A colorful cookie made to look like Iron Man is perfect as an ice cream sandwich. It all started with Iron Man. It's hard to believe that the Marvel Cinematic Universe turns 10 this year. Back in 2008, Robert Downney Jr. made his superhero debut as Tony Stark and Iron Man. It's hard to imagine anyone else playing this character. RDJ is Tony Stark! This year has been filled with lots of great interviews of the cast from Infinity War talking about their time on set with RDJ and how he is the godfather of the Marvel crew. He takes great care in helping new members of the cast. He even has his chef create amazing lunches for everyone. He's pretty great. After you've made your cookie dough, separate the dough into two equal parts and place each one in a separate bowl. 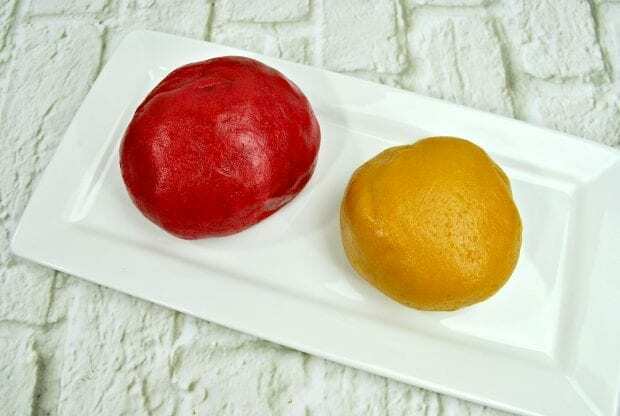 Use food coloring to color them with Iron Mans colors of red and gold. 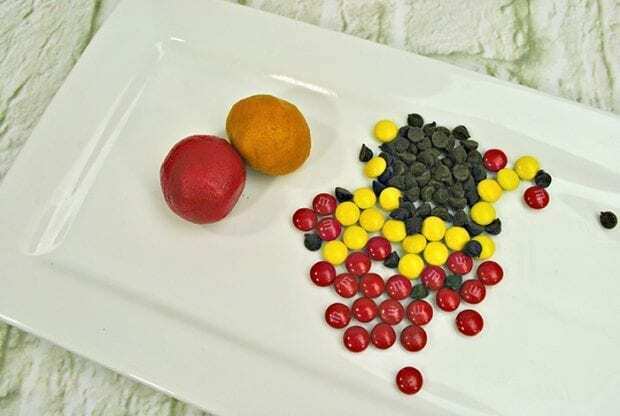 You'll want to separate out the red and yellow M&M candies so that you stick with your Iron Man colors. 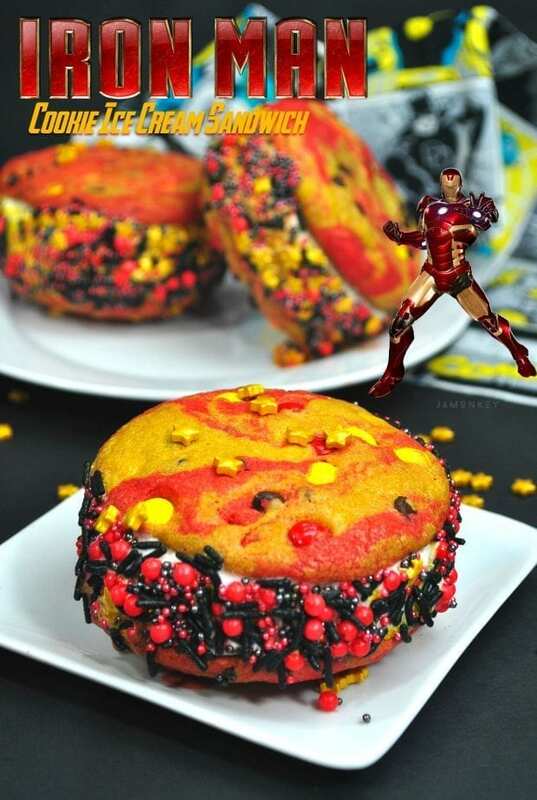 Take a little of the red dough and a little of the gold dough to create the Iron Man cookie. Mix in a few of the mini chocolate chips and the M&M's. It's best if you keep the candy close to the top so that you can see them when you make the ice cream sandwiches. Allow your cookies to cool completely before placing the ice cream on them. Scoop out ice cream and place it on a parchment covered baking tray. Try to get it to be about 2 inches thick. Place in your freezer for 1 hour. Use a circle cookie cutter to cut out the ice cream. Place them between two Iron Man Cookies. 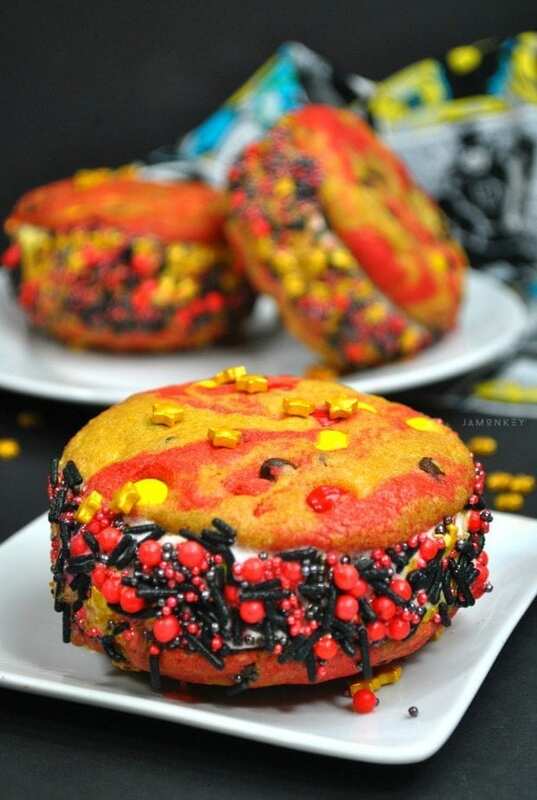 Roll the sides of the Iron Man Cookie Ice Cream Sandwiches in sprinkles and then place on a prepared cookie sheet. Freeze the ice cream sandwiches for an additional 30 minutes. 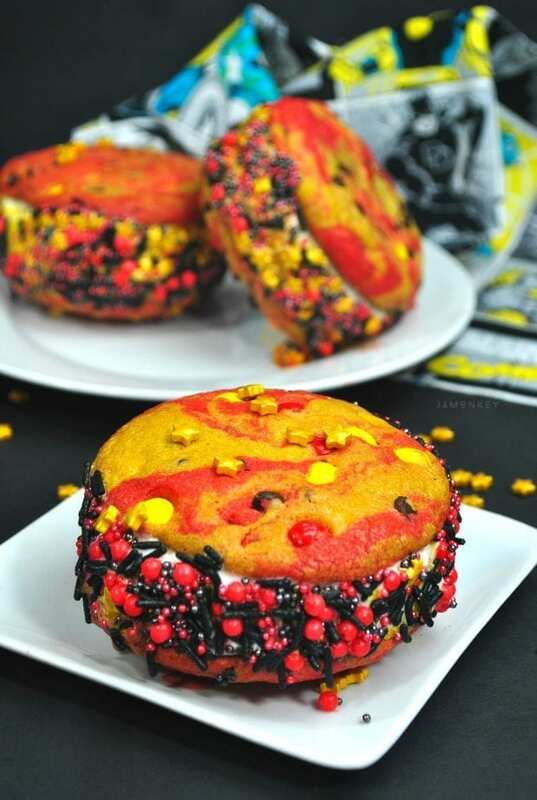 Black red and gold cake sprinkles. Add the eggs and vanilla to the sugar mixture and mix until combined. Now add the Baking Soda and salt and mix. Add the flour a cup at a time to the sugar mix. Mix until it is completely combined. Separate the cookie dough into two equal parts and place each one in a separate bowl. Use food coloring to color them like Iron Mans colors, red and gold. In a bowl separate the M&M's so you only have red and yellow. Add chocolate chips, and M&M's to each portion. Using a small ice cream scoop create a cookie dough ball. 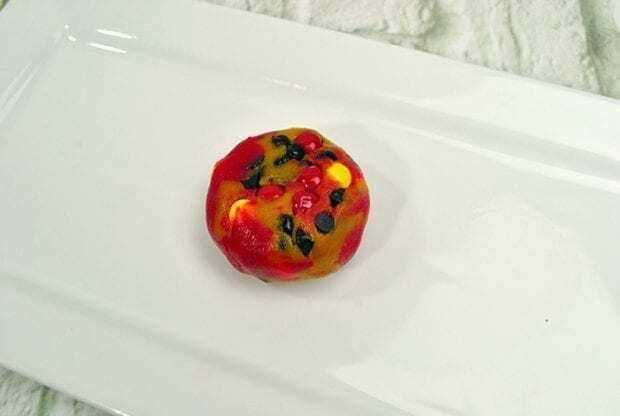 Scoop a portion out of each color and hand combine them and roll in your hands to create a cookie ball. Slightly press the cookie ball down onto the cookie sheet. Bake in a 375-degree oven for 8-10 minutes or until golden brown around the edges. Take your vanilla ice cream and allow it to slightly melt. Scoop out ice cream and place it on a parchment covered baking tray. Try to get it to be about 2 inches thick. Place in your freezer for 1 hour. Use a circle cookie cutter to cut out circles of your ice cream. Place your cake sprinkles on a plate. Place the ice cream on one of the cookies bottom side up. Then place the other cookie bottom side down on top of the ice cream. Roll the edges of the ice cream into the sprinkles. Place the completed cookie on a baking tray covered in parchment paper.